Definitely agree with the top of the line monster computer. It doesn’t just speed up development, but keeps you more engaged when developing. I thought you were crowd sourcing the translation. I suppose there are still some translations that have to get done. Next, Production Line isn’t what I would consider a music heavy game. Most users probably turn it off. Sound also is minimal (clank, clunk, chunk, bunk). So I wouldn’t fret too much about it — but admit good title screen music can get the player charged up for the game. Finally, 10% boost in coding may not be possible. 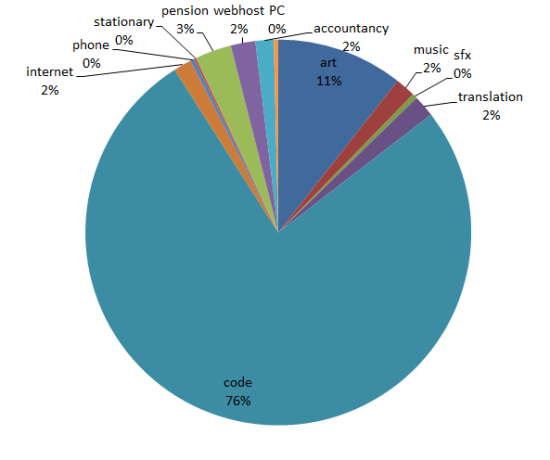 Perhaps you should do pie charts for your time each day? 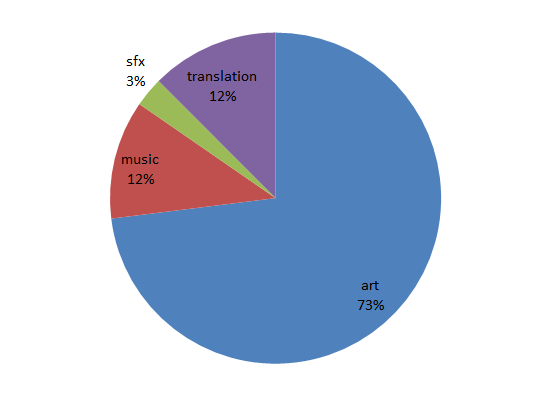 So are you a solo programmer that contracts out the art/sound/translation? If so those numbers definitely make sense to me. The most expensive thing in a business is usually the employees. So if the art/sound/translation is contacted out then it should be significantly cheaper compared to a full time employee. If you had a full time artist I would suspect the art category to be significantly higher. Let me know if I’m off base here. 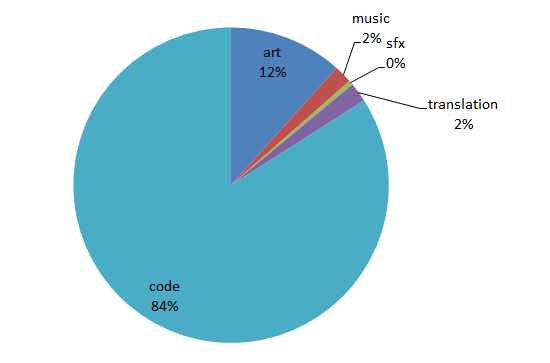 I guess some of the “Code” slice really belongs a bit to the Project Manager, Producer, PR department, Community manager, QA department etc. Very good point. Code just means ‘me’ when it should really be code, bizdev,marketing,support.